Whitepaper by Deloitte and Aegis on "Opportunities In Telecom Sector Arising from Big Data"
According to Industry analysts, projections are of 32 billion devices generating 44 trillion GB of data by 2020. Read more and download the white paper..
Every day, we create 2.5 quintillion bytes of data — so much that 90% of the data in the world today has been created in the last two years alone. This data comes from everywhere: sensors used to gather climate information, posts to social media sites, digital pictures and videos, purchase transaction records, and cell phone GPS signals to name a few. This data is big data and mainly constitutes the unstructured data. This Big Data offers challenge in term of storage and further analysis in rest of in real time. One can dig gold mine if we are able to make sense out of big data. In a global and highly interconnected world we live in, the one greatest power is the right information. Data Science, Big Data and Business Analytics is thus the primary tool for any organisation, society, Govt. to seek for competitive advantage and optimisation of the existing ecosystem. A career in Business Analytics, Big Data and Data Science promise a lot of challenge, opportunity, and reward. Data Scientists are super men who tell stories out of the data, respective of the size of data: big or small. They answer questions like what’s happening. What will happen? What we should do now? These are commonly termed as BI, Predictive analytics and Prescriptive Analytics. They use statistics, Machine learning, NLP, R, Python, Hadoop, Spark to create Crystal Ball to predict future, solve business problem or find out the missing opportunities. Snapdeal, which has over 20 million subscribers and generates terabytes of data through the interactions that happen with customers in addition to a catalogue of over 5 million, churns 15 million data points (related data set like a consumer shopping on specific days for a particular thing) within two hours, using Hadoop. About 35% of its orders come from recommendation and personalized systems, and the conversion rate of such orders is 20-30% higher than normal orders, the company claims. Post Graduate Program? 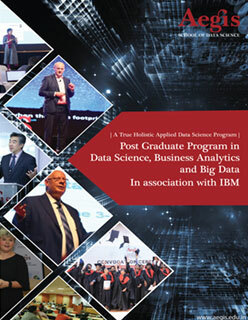 Masters in Data Science, Business Analytics and Big Data(PGP-BA-BigData) is India’s first high end data science program designed and delivered by Aegis School of Business, Data Science & Telecommunication in association with IBM and to train the new generation of data-savvy professionals. This 11 months program provides you intensive hands-on training to develop the necessary and unique set of skills required for successful career in the fastest growing and intellectually stimulating fields of Data Science, Big Data, Business Analytics, Predictive Analytics, NLP, ML and Cognitive Computing. Students who earn a PGP develop deep quantitative capabilities and technical expertise and are equipped to create business and social value by extracting useful insights and applying it in a various industries by playing a role of Data Scientist or modern Business Analyst. This program is delivered at Centre for Excellence in Telecom Technology and Management (CETTM), MTNL's world class campus with state of art "IBM Business Analytics Lab" and "IBM Cloud Computing Lab" at Powai in Mumbai. Certification from IBM, world leader in Big Data Analytics at the completion of the program. Aegis and NVIDIA will train and provide certification on the fundamental tenets of deep learning such as using AI for object detection or image classification, applying this to determine the best approach to cancer treatment; Natural language processing, speech recognition etc. This Program is core technology MS in Data Science program and NOT a inferior cousin of MBA/PGDBM programs in Business Analytics. This program lays down your foundation for serious Developer, Data Scientist Career or Big Data Advisory & consulting roles. IBM has setup an IBM Business Analytics and IBM Cloud Computing Lab in the campus. The program is delivered by IBM subject matter experts and best Data Scientists from around the world. Live Projects: work on live projects like Churn Predication, Call drop analysis from leading teleco; NLP projects, consumer analytics, sentiment analysis etc at Aegis Big Data Product Factory as part of program. On campus classes held at world class infrastructure at Aegis, CETTM, MTNL at Powai, Mumbai. Career Management Center (CMC) at Aegis facilitates all students placement and paid internship opportunities. Paid internship are for 2 to 3 months with various companies to give them reallife live experience which generally leads to final placement as role of Data Scientist, Manager Data Science, Business Analyst, Risk Analyst etc like Accenture, Atos, Angel Broking, Cybage, edelweiss, HDFC, Ford Automotive, Fractal, VM Ware, IBM, Aditya Birla, Suzlon, Eclerx, Aureus Analytics, Deloitte, Exponentia, Clover Infotech, Value Direct, Virtusa, Credit Vidya, Shzertech, Loginext, Persistent, L & T Finance, Whizminds, Mii app, Mobiliya, Emmfer, Infrasoft, Impact Analytics, Eigen Technologies, Intelenet, Pentation, Light app, Ixsight, Softcell, Easy Farm, Free A Billion, Exponentia Data Labs, Open Insights, eClerx, Kryptoblocks, Bayer, Cuddle, Farebond etc. Experience Candidates got over 100% hike on last Package. *For experience up to 7 to 8 years. Deans Scholarship for Women in Technology Leadership; Aegis Graham Bell Award Scholarship for Big Data Products; Data Science Scholar. Study Loan by HDFC Credila. This program follows Globally acceptable 45 Credit Unit for master degree. In North America any master degree is min 36 Credit Unit. This program is spread over 9 months plus 2-3 months Internship or consulting assignment. The curriculum caters to the skill requirements in various industries like Ecommerce, Telecom, Banks, Computer Services, Education, Healthcare, Insurance, Manufacturing, Retail and other industries. Aegis participants' are from around the world with experience ranging from 2 year up to 25 years from diverse industry and background. 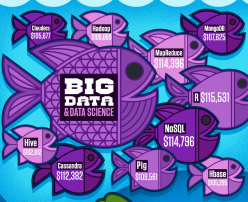 Is Business Analytics, Big Data and Data Science for me? If you enjoy working data in different ways, exploring the stories that data may reveal, and even experimenting with visualization techniques, you may enjoy a role in data science. Whether you have an academic background in business, economics, technology, statistics, mathematics, or engineering, you are looking for a career change that will prepare you to generate high impact. You search for a challenging role that allows you to integrate the value of data into all business functions. Data analysis is necessary in almost every field and industry and Business Analysts, Big Data professionals and Data Scientists are expected to play a role in guiding strategic decisions. They are in a unique position to assist leaders in determining the right questions to ask as well as in interpreting the answers that data provides to help determine the organization's most effective courses of action. While there is a large and growing demand for professionals trained to collect data and use analytics to drive performance, there is currently a deficit in the supply of these individuals in the global job market. The deficit in the market for data/ Big Data analytics professionals is growing exponentially and poses a serious challenge for recruiters, but it is an enviable opportunity for professionals who have the right skills and training to fill these positions.